Business cards are an effective way of getting your name or brand out there despite being one of the smallest marketing tools. From small businesses to global enterprises, a business card can help your network grow. A business card is a quick and simple way to get your brand in front of potential customers. Given their handy size, business cards are with you at all time. Business cards are useful for chance meetings with customers. They are also ideal when attending networking events or business meetings. Your business card is likely to be the first time the recipient sees your brand. It is imperative that your business card makes a great first impression. 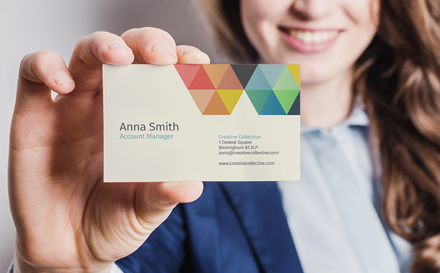 Let’s take a look at some of the top design tips for creating a great business card. Use both sides of the card to avoid blank spaces. You wouldn’t leave a page empty in your brochure. You shouldn’t leave a side of your business card empty either. It is good practice to the back of your business card for your company branding. You should include your company name, brand colours, and logo. The front of your card should include all your contact information. The least should be a name, phone number, email address and website address. Business cards provide customers with contact information should they need your products or services. Make sure, like any piece of print marketing, they are easy to read. This means using an easy to read font and designing a layout that is easy to follow. Your branding should be consistent across all your marketing materials whether online or offline. This is definitely true for your business cards. After receiving your business card the recipient is likely to visit your website. It is important that your branding is consistent. Make it easy for the recipient to recognise when viewing any other marketing materials. Although the price may be a factor when printing your business cards always choose a thick card. Your business card may often be the first time someone comes into contact with your brand. A high-quality business card will make a far better impression than one that feels and looks low quality. A heavier card will also be more durable and less likely to tear or get damaged. Remember, a card design which includes heavy ink coverage will be better suited to a heavier, thicker stock.